Years ago I purchased some oil sticks to play with, not having any idea that they would lead me here, to share my encaustic experimentation with you. Searching for information about using R&F pigment sticks with encaustic, I found All Things Encaustic and I was delighted to connect with Ruth who is from Toronto—I am also in Canada, just a little distance away in Westport. Recently I have been working with plaster on jute or burlap before adding layers of wax. In this post, I share my experimental work and process . As I love to work with plaster and cement, I was delighted to find the book Plaster Studio by Stephanie Lee and Judy Wise. I have used some of their ideas as jumping off points for my own work. What I love most about encaustic is the texture that can be built up in many layers. But I have also discovered that great texture can be created using a plaster on jute for a base. I spread a sheet of 6 mil plastic on my work table as the plaster can be messy. Sometimes I use a runny plaster if i am going to adhere the jute or fabric directly to a board. This photo shows this with the jute adhered with runny plaster to a board with canvas paper surface. This panel shows a piece of burlap adhered to hardboard with wax. The second photo shows this piece with thin plaster spread over it and some alcohol inks beginning my design. And the third photo shows a detail, look carefully and you can see the board beneath the burlap wisps. 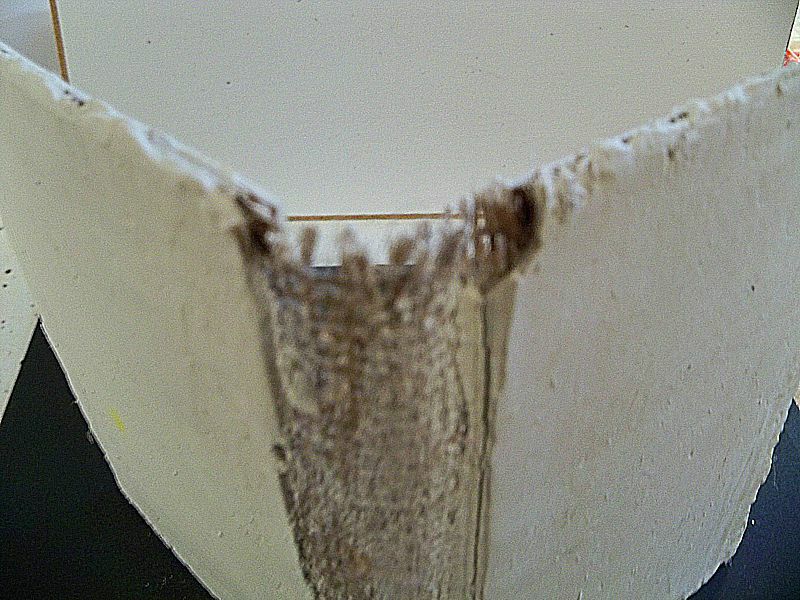 Jute was laid on a piece of plastic and the back area and front cover area were coated with venetian plaster with the spine left as jute, although a bit of plaster did find its way there. Then two pieces of archival mat board were glued to the other side of the plaster covers. This next surface will be for a painting, but here you will see only the beginning. This ground is made from plaster the consistency of heavy cream to cover one side of burlap. When it was set but not too hard, I picked it up and rolled it and folded it in several directions. I then glued it to a piece of board. All these plaster surfaces will be worked with encaustic medium and alcohol inks. Have you used venetian plaster as a ground for Encaustic painting? I would love to hear from you about your experience. Have a question about preparing a plaster ground on jute or burlap? Add a comment below and I will be happy to respond. Having done art all my life I finally find myself at a place where I can devote much of my time to playing and learning and creating art that speaks me. I recommend the book by Lee and Wise. I have tried to add my own spin to their work, and recommend that you do also. I can’t wait to try this. Thanks!!! i have not had any problems with the plaster or the wax coming free of the boards i use for supports. sorry i misread your question. i would try, but i think you would have to use a fair bit of plaster backing if you did not want to attach it to a board. the plaster on burlap is fairly floppy with just the amount of plaster i use. so i would attach to a board with the work a wee bit larger than the board and then float the board in the frame. what kind of a board do you use and how do you hang it on the wall? Im interested in the runny plaster so you can crack it, you could also make some 3D pieces it looks like. Can’t wait to get to my studio tomorrow and try it. What glue do you use to secure it to the board? well, I hope I can remember…I use either hardboard or quarter inch plywood. I use another layer of the plaster to stick the jute to the board. or else I use weldbond or gorilla glue after the jute has been crackled if I think it will stick better. Either one has worked ok for me. either put a wire with screws on the back of the board or frame it in a floater frame. especially if i have used a wooded cradled support it is easy to finish for hanging. you can play around with it, but plaster sets pretty quickly so sometimes I just use drywall mud altho I think plaster is much more permanent. glad to have inspired you…feel free to ask if you need more info. Hi thanks for your tips…when you adhere the coated burlap to a substrate, do you use a glue or just wax medium..can you use ordinary plaster, drywall compound, or is venetian plaster better…sorry for so many questions, but I’m going to have a go at this..
yes, you can adhere the burlap or jute with either plaster or wax or glue. if i have plastered the burlap first, i will usually use glue, but a thick glue like weldbond that i can embed the plaster in and then weight down with some books overnight to dry. with raw burlap i have just used wax and so far all are fine. just make sure that the entire surface is stuck to the support. you can use drywall compound but it will resoften with water, where as plasters won’t. once set, they are hard forever! sometimes i just add white glue to the plaster and it is stronger, venetian plaster has latex paint in it as well for a different surface. just experiment and have fun..
Hi Georgia. I have been using plaster with encaustic for several years. I use the pre-coated plaster/fabric strips that we used in grade school for art projects. I soak it very briefly then squeeze out the water. I use it on a rigid substrate and shape it, then allow it to dry, usually only an hour or two. It forms a great surface with texture and shape and adheres to the substrate. I use several layers of wax on it but have also tried just using a few–both work well. It’s my favorite method for creating depth and texture. adding 5-10 % white glue as part of your liquid concentration when mixing plaster works great. i have adhered burlap to the wax board using the plaster (with glue added to mix) and it worked fine. and i have also adhered it onto a hot wax layer and then heating the burlap again on the board. if you dont want your wood to show through, use a milk paint in white as your base for your board aka primer. i often paint with the milk paint on the wood base for texture. and i also paint with the plaster mix. using a brush. on wood. the plaster is easily colored. i am going to try the plaster sheets for great texture as you suggest. i often just glue a piece of watercolor paper to my board before working. altho i do someitmes leave the wood for a different base color. i do use white glue in both plaster and cement as it gives a bit of plasticity to the work. yes, those are great ways to prepare the surface for encaustic. Hi, I was just wondering what glue you used in Experiment 4, to stick the burlap to the board? I like the effect you have achieved with this. Hello! I’ve made a plaster strip sculpture of a Pokemon, and I’m hoping to use encaustic techniques to paint it. Any advice? I need it to have a smooth surface all over. How does the temperature of the room affect the wax?